We feel that when you have a carbonated soft drink, it should be uncommonly good. A sweet and sticky corn syrup soda may not be a necessity, but it can be pleasurable. Make that experience all the more pleasurable with Batch Craft Soda. 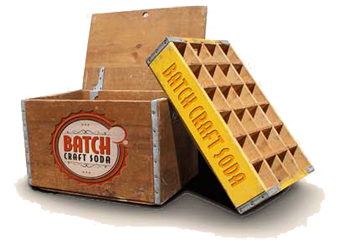 Batch Craft Soda has been concocted to be just that: an exceptional beverage in every way. Our expert amalgamators blend only the finest ingredients to create a truly outstanding libation. Weights, measures, temperatures, rest times, and even the order in which the ingredients are added were carefully tried and tested. Efforts to create the perfect recipe took batch after batch. We invite you to experience Batch – a true craft beverage.